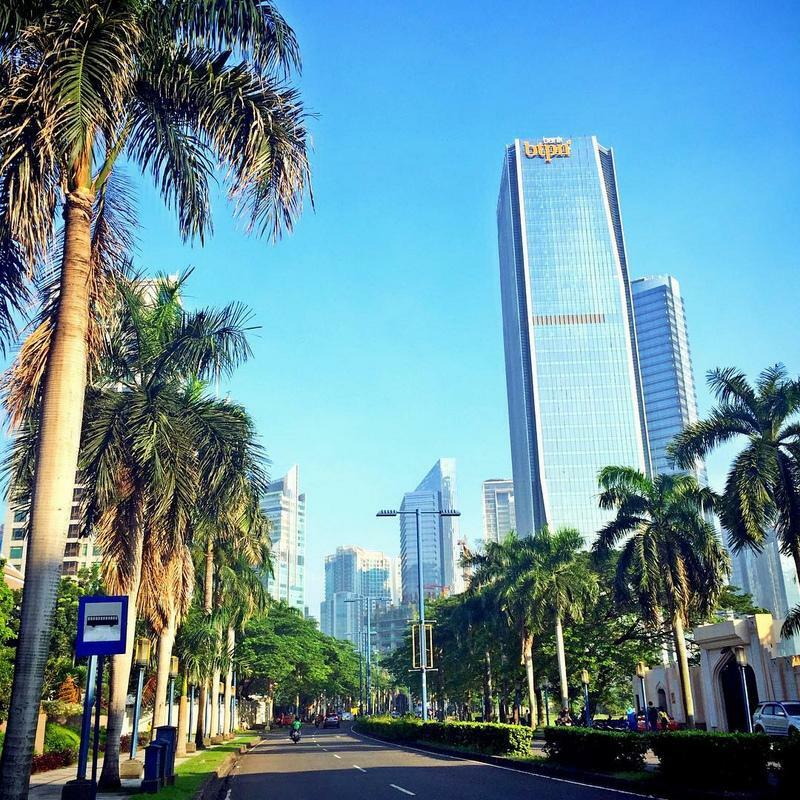 If you visit Jakarta as a tourist, you are probably wondering about the best areas to stay in the city. Due to the horrible traffic and the lack of public transportation, I advise you to choose your location carefully. 1 kilometer in Jakarta is like 10 kilometer in normal cities. Just going to the opposite side of a street by car can sometimes take up to 30 minutes! The best place to stay in Jakarta, either you are a tourist or a businessman, is around Plaza Indonesia or Grand Indonesia, for instance: Kempinski, Grand Hyatt, Pullman, Mandarin Oriental. It is an expensive area though so if you are on a budget, you can stay near Sarinah Mall instead. You'll find backpacker hostels (Jalan Jaksa), 2-star hotels (Favehotel), 3-star hotels (Holiday Inn or Ibis Tamarin) and 4-star hotels (Morrissey, Four Points by Sheraton, AONE or Akmani). Need more addresses? 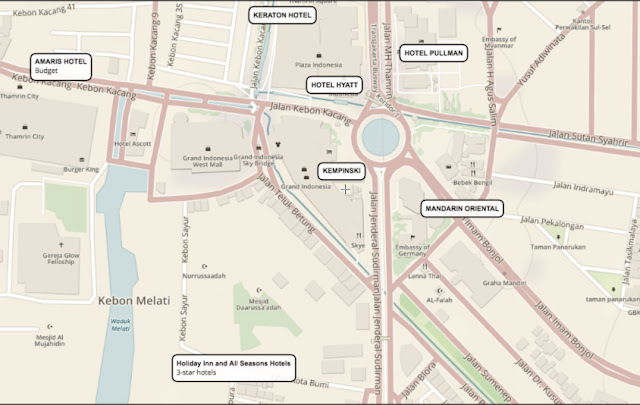 See the following recommendations for Hotels near Grand Indonesia and Hotels near Sarinah. If you have time to read my whole review, I will list below all the potential areas for you to stay in Jakarta, starting from the best. The iconic Hotel Indonesia roundabout (Bunderan HI in Indonesian) is one of the most famous landmarks in Jakarta. All around it are 5 luxury hotels (Kempinski, Grand Hyatt, Pullman, Mandarin Oriental, Keraton at the Plaza) and the two best malls in Jakarta (Grand Indonesia and Plaza Indonesia). Both of these malls are great meeting points with lots of popular cafés, cinemas, restaurants, bars (Cloud, Social House, Skye) and nightclubs (Immigrant). It is a modern part of Jakarta ideal for lifestyle travelers who are interested in shopping, eating out and partying. It is also central so you can reach other parts of Jakarta fairly easily (for Jakarta standards). In particular, it is just a few minutes away from Tanah Abang (budget shopping), Jalan Sudirman (business district) and Menteng (government offices). Attractions like the Monas or the National Museum are only 15 minutes away. You can use public transportation to reach any of these (Transjakarta). Between 1h and 1h30m with normal traffic conditions. The Sarinah Shopping Center is only a kilometer north of the Hotel Indonesia roundabout (see above), but the feel is much different. It is a middle-class area with affordable shopping and restaurants. You will also find great Indonesian street food 24/7. Most buildings are low-rise but this might change soon as several towers are being built. There are many convenient businesses for travelers, some of which are open 24-hour: Money changers, travel agents, internet cafés, printing services, photography shops, etc. You also have several laundries (one of which is a coin laundry). The mid-range hotels are along the streets Wahid Hasyim and Agus Salim (nicknamed Sabang). If your budget is very tight, meaning under 10$ a night, you can get a room in Jalan Jaksa. Many of the cheaper guesthouses are not listed on the internet so it's best to just walk around and look for "room for rent/kos" signs. The location is just as strategic as the one in Hotel Indonesia (you can walk there in 15 minutes). If you are not interested in going to malls, it is probably even better. East of Sarinah is the upscale area of Menteng-Cikini, where some of the richest Indonesian families live. It is central to many nice restaurants, a few museums, public parks and cultural attractions. Hotels tend to be either pricey or low-quality. The Golden Triangle is the main business area of Jakarta and it is made from the following streets: Gatot Subroto, Rasuna Said and Sudirman. It comprises some famous neighborhoods such as Mega Kuningan, SCBD (Sudirman Central Business District) or Setiabudi. It extends in the South until Plaza Senayan and Senopati. Mega Kuningan and SCBD are exclusive and modern areas with a Western city planning model. You'll find blocks, large streets and sidewalks, just like you would in an American city. It is the trendiest part of Jakarta and home to dozens of hip bars, clubs and restaurants. There are also several 5-star hotels (Ritz Carlton Mega Kuningan, Marriott) and luxury malls (Pacific Place). It is cleaner than the rest of Jakarta and you have fewer traffic jams. 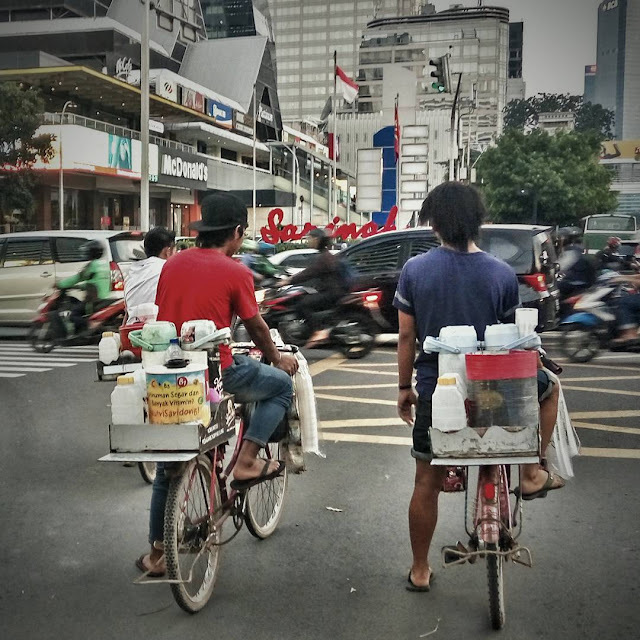 Some would say it's a ghetto for rich people that has nothing to do with the real Jakarta. Many young, single expats choose to live there when they can afford it. If they don't have the budget, they may choose to stay in Setiabudi instead (see below). Jalan Sudirman, Jalan Rasuna Said, Jalan Gatot Subroto are some of the busiest streets in Jakarta. They are packed with cars, messy and polluted. Still, choosing a hotel directly on one of these thoroughfares is a good idea to avoid unnecessary commuting time. Most are 4 and 5-star hotels though. Between 45 minutes and 1h30m with normal traffic conditions. Gatot Subroto is the closest and it is connected to the airport highway. Mega Kuningan is more difficult to access (traffic bottleneck). Setiabudi is a residential and low-rise neighborhood in the northern part of the Golden Triangle. Its residents were originally low to middle-income families, but this is starting to change as the land prices increase. Many houses have been transformed into boarding houses, small apartments or hotels which are popular with single office workers (both Indonesians and expats). You can get a room there for an affordable price while being near from the Central Business District (more information: How to Rent a Cheap Room in Jakarta). It is a great area for street food as well. Staying in Setiabudi would not be my first recommendation though if you are a tourist because it can be difficult to get there (traffic) and to find your hotel (small streets). Strictly speaking, Kota Tua (Old Town in Indonesian) is the area around Taman Fatahillah Square in North Jakarta. 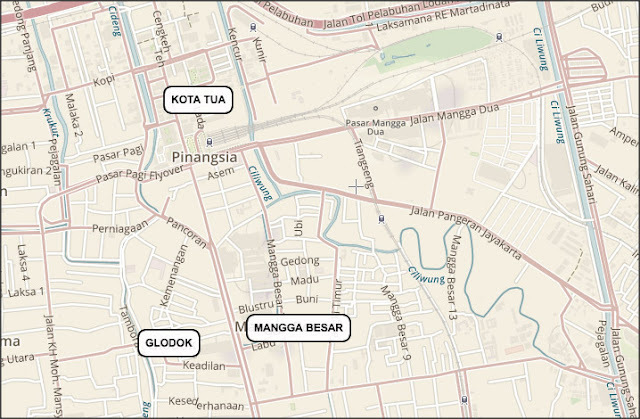 In this review, I use it to describe a larger zone inclusive of Mangga Besar and Glodok. Kota Tua is infamous for being a red-light district: This is where you will find the most expensive naughty massage parlors, strip clubs, nightclubs and gogo bars in Jakarta. Most hotels are used for short time and the streets are busy 24/7. In spite of this, staying nearby has several advantages: Hotels are much cheaper than elsewhere and they are close from many tourist attractions (Chinese temples in Glodok, Museums, Sunda Kelapa). Some people, including myself, also enjoy the authentic street life. Jalan Mangga Besar in particular is one of the best places to eat street food in Jakarta. From Kota Tua to the city center of Jakarta (Plaza Indonesia), it will take about 1 hour with normal traffic conditions (30 minutes at night). There is a very convenient Transjakarta line from Kota Tua down to Blok M that goes through Monas and the the National Museum. Between 45m and 1h15m with normal traffic conditions. Kemang is a popular area with expats because it is near from the international schools. Many live in expansive villas with swimming pool and gardens. It has a vibe similar to the one in Seminyak. As a tourist staying in Kemang, you will be near from many designer shops, good Western restaurants and several bars and clubs. On the negative side, there are no tourist sights and it is far from the city center. This area is strategically located as it is between Sudirman and Kota Tua. There are not so many things to do in the immediate vicinity apart from some famous strip clubs and massage parlors (Malioboro, V2, Emporium). Recommended if you are planning to visit places in both South and North Jakarta. They have recently opened several brand new hotels such as Harris Harmoni Vertu, Hotel Santika Premiere Hayam Wuruk and Novotel Gajah Mada. In North Jakarta, Mangga Dua is a shopping area with several naughty nightlife venues. It can easily be reached from the airport by the toll road, and it is not too far from the city's tourist attractions like Kota Tua or Ancol. If you need to go to the South, it will take you about an hour. If you only have one night in Jakarta, it can be a more fun option than staying near the airport. After two nights, you might get bored. This area is in the vicinity of the malls Central Park and Taman Anggrek. You can stay there if you want to be closer from the airport as it is only 40 minutes away by car. Downtown Jakarta is about 30 minutes away. This is an upscale area where many Rich Indochinese families live. It is close from the airport (less than 40 minutes) and you have a growing nightlife scene (see my review Nightlife in PIK). There are not many reasons to stay in Kelapa Gading apart from shopping and nightlife. For shopping, you have several malls including the gigantic Mall of Indonesia and Mal Kelapa Gading. For nightlife, you'll find mostly massage parlours plus plus, brothels, strip clubs and beer houses (Sumo, Delta, King Cross, Level 5 and other prostitution joints). Contact me by email thibaud@jakarta100bars.com if you have any questions about where to stay in Jakarta (or just leave a comment below). 27 comments to '' Where to Stay in Jakarta - Best Areas for Tourists (2019) "
Hi Benny, it depends.... what do you want to do in Jakarta? There are some malls over there and middle-class restaurants, but not many tourists attractions and limited nightlife (except spas and strip clubs). Hi, I am Indonesian, but lives in the US for 32 years and plan to be in Jakarta for 4 nights. I play tennis for fun. Are there any tennis club in Jakarta where we can rent a court? Hi, i will stay in Jakarta for 5 days on Mercure Serpong Alam Sutera, i had to choose that hotel by bussiness recomendation, but i want some fun!! Appreciate if you can help me best ideas,recommendation, girls!! close that hotel!! Hello need opinion from the expert.Is AOne hotel in jln Wahid Hasyim girl friendly?thanks in advance. Any idea which hotel have smoking room in thamrin area/wahid hasyim near sarinah mall? Hi, have you read this article: Where to Party in Jakarta + Hotels Nearby ? Question, are Ritz Carlton and Pullman girl friendly? I cannot write them an e-mail asking that, or could I? Is Marriott Executive Apartments Mayflower and Fraser Residence Sudirman Jakarta Girl friendly ? Marriott Apartments Mayflower and Fraser Sudirman are both girl-friendly. They are very good choice, very central, but a bit pricey. Hello, its been a while since the last time I have stayed in jakarta. Last time, I was staying in orchards Industri and I booked spa girls into my room. Where can i find n get girls at area north jakarta..get to sleep with me.. I am travelling with my family of 5 and they like to stay near an area with easy access to shopping and massages and hairstylist. please advice. Hi... if you have a comfortable budget, stay near Grand Indonesia or near Plaza Senayan. Harris Hotel for instance. hello!Thank you for your information! is really helpful but i am a bit lost too. i am stoping only for one day in Jakarta. i am travelling alone . where do you think i should stay? at least which area is the most worthseeing, traditional/safe ?Please help :) Thank you ! - The old district (Kota Tua) near Taman Fatahillah : It is the most touristy part of Jakarta with several museums, old buildings and Chinatown. The problem is that the number of nice hotels there is limited. It is also a more dirty and less modern part of Jakarta with no shopping malls and few hangout spots. - Jalan Wahid Hasyim (near Sarinah Mall ): This is a more central location, about 25 minutes from Kota Tua. Many budget and 4-star hotels. Near very big malls, the National Museum, the Monas, the Istiqlal Mosque, Grand Indonesia Mall, and some good street food. Public transport easy to reach. For me, this is the better choice. Try the brand new Erian Hotel for instance (40$ per night). hi! my husband and i want to go there for buying cheap cloth and other items,can you recommend where to stay and where to shop?